This entry was posted on Saturday, January 5th, 2008 at 05:27 pm	by Keith Neufeld	and is filed under Hacks, LED Puck, TechArt. You can follow any responses to this entry through the RSS 2.0 feed. You can leave a response, or trackback from your own site. I’ve been wanting to lower the times on a similar unit that uses the same bis ic. Thanks for sharing this experiment. You saved me some work. Thank you too SunGear. The first thing I looked for was this datasheet but I only found it in Chinese. Now it’s time to give this hack a try. 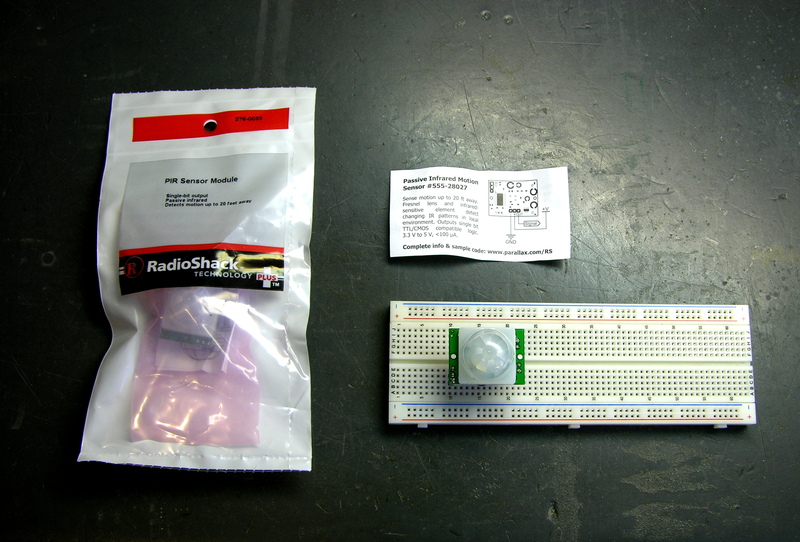 Thanks a lot, I followed your advices and I put in parallel a resistor on Rx and Ri and I’ve now half a second of HIGH state when the PIR detects and half a second for rearming. That’s perfect ! But your calculations are only for the time constant of that R & C. In most practical circuits a time delay is given by zRC where z ( should be Greek zeta ) is typically 0.5 to 0.75, so you can’t say what you did. It looks like the numbers (calculated ) could actually match what you found if you use the right zeta. Is it possible to use the sensor for read temperature such as infrared thermometers? The descriptions for all these PIR sensors (and there a quite a few close variants in the market) speak of the “blocking time” which in your article you designate as Ti. I can see the point of having a blocking time if the sensor is set to non-retriggerable mode, so it times out after a fixed delay, irrespective of what further movement pulses are detected, For that mode it makes sense to have a defined inactive period before a retrigger can occur. But in “retriggerable” mode a blocking time makes little sense. If the movement pulses are coming in with a period less than the output dwell time of Tx, then you want the output to remain high. If the degree of movement means the output times out, then for all practical purposes you want it to return high as soon as possible with a zero blocking time. Think of a corridor or cupboard light: if movement stops for such a time that the output goes low from lack of movement, it’s a nonsense to make the device unresponsive to subsequent movement for any time at all, let alone the default 2.5 seconds. In retriggerable mode the blocking time should be zeroed out altogether. Yet in the assemblies I have made so far it is still present. The variant I buy ex Hong Kong (for about $0.60 USD each in 2016) has two trimpots on it: one for setting Tx and the other is a sensitivity control which translates to be a range control. Both work well. 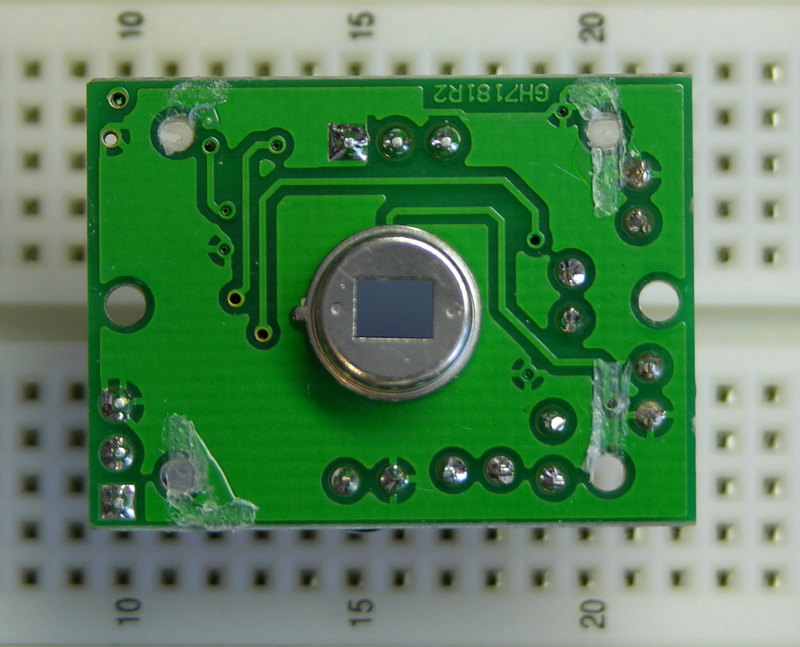 There is also a pair of holes on the PCB for a CdS resistor so it can do daylight sensing. I don’t know why they don’t fit it universally, as it is easier to cut it out if not required, than to add it in after manufacture. The output drives from 0V (no movement) to around 3.5V when on. 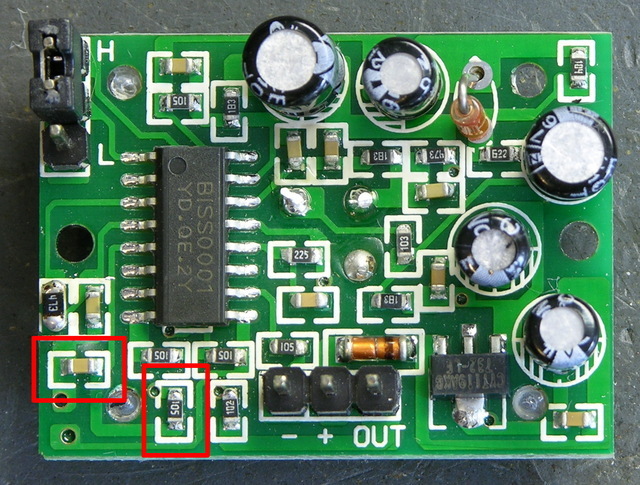 This is pretty usless for directly driving anything other than an Arduino input, but by adding an NPN power transistor with its base directly connected to the output pin there is enough current gain to drive a fair length of LED strip lighting, or providing base current for a relay driver. A power darlington is a better choice for loads upwards of 800mA. The limiting resistor of 1K internal to the chip means direct connection to the base won’t do any harm. Someone mentioned collimating the field of view to get more directionality. Masking the lens internally with one or two layers of insulation tape cut to cover unwanted fields (white tape will do as well as black) is easier, and does not take up any more room like a collimating tube would. Painting the lens with white-out is just as good, but harder to adjust after the painting. Remember it’s IR you are trying to mask. Visible light is irrelevant, so total opacity is not needed. Thanks to Keith for a great and instructive hack. To Grumpy_Mike and the zeta factor he mentions….surely zeta in this case is exactly 49152, as given by the manufacturer. I agree with G_M that usually for an RC circuit it is ln(e) or some number in the range he cites dependent on voltage thresholds of that circuit. But this is clearly not a simple RC timer, but a time that uses R and C and a binary plus a trinary divider chain to give a multiplication factor of….49152. I think Keith is right that the discrepancy comes from measurement artifacts, a supposition that fits in well with the precise scaling of the timing variation with resistance variation. To Fabio who asked if the device could be bent to measure temperature… No! Not without total remanufacture. A bit like turning a car into a bathtub. About the only thing usable would be the pyroelectic element. All the circuitry and especially the chip and lens would need to go. What should I do if I do not want any value for Ti. I don’t want any time interval that the sensor is not triggerable.